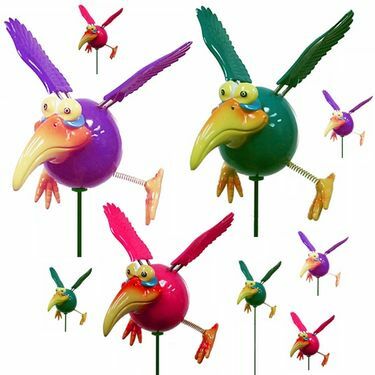 Home > Holiday Specials > Dodo Birds Holiday Stakes - 2 Dozen! Looking to enjoy major personality and humor in your garden? This infamous dodo bird set is the #1 Employee Favorite MEGA-HOLIDAY Special! Of all the stake we sell, why the Dodo Birds at such a crazy low price? I'll let you why - Because of all the beautiful butterfly stakes, dragonfly stakes, hummingbird stakes, glass and solar stakes we sell - no other Stakes get sent to people as whimsical gifts more often throughout the year. That's right - PEOPLE LOVE THEM! Beauty is the garden is one thing for sure, but making people happy AND delivering a humorous laugh - priceless! We love gorgeous yard art, but delivering silly humorous gifts is awesome - especially during the holidays and beyond. These silly birds have been making people smile for decades, why should they stop during the holidays? With bright colors, and wacky expressions, these artistic garden stakes promise to leave your guests in a great mood, and laughing out loud. If you enjoy making others smile, and need a reminder not to take life too seriously, than your going to love our festive out of this world Dodo Birds! This 2 Dozen Piece Set arrives with three different colors - you get 6 Purple, 6 green, 6 bright red and 6 of our very popular hot pink color birds! These flightless birds will flap their wings in the wind and go nowhere as usual. Cover your friends' lawn with these hysterical holiday garden stakes! Collect the bunch, or give them away in mini-bunches or individually as whimsical gifts. These creative and unique holiday items will certainly impress and amuse! Bursting with personality, hand-painted with vivid colors. Patented "springed" wings design moves in the wind! UV treated paint with a special lacquer coating protection.